Inside Each Box: 3 hits per box! EACH HOBBY BOX OF 2019 TOPPS ALLEN & GINTER DELIVERS 3 HITS, INCLUDING ON-CARD AUTOGRAPHS, RELICS, ORIGINAL A&G BUYBACKS, BOOK CARDS, CUT SIGNATURES, AND RIP CARDS! BASE CARDS – Featuring 300 of the top MLB® stars, Rookies and retired greats, as well as non-baseball champions. BASE CARD SHORT PRINTS – 50 subjects not found in the base set. 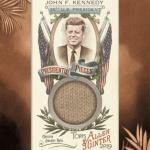 ALLEN & GINTER FULL-SIZE RELICS – Featuring MLB® Players, world champion athletes, and personalities. Highlighting MLB® greats, current stars, and rookies! Highlighting personalities and world champions! 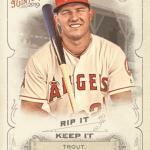 ALLEN & GINTER RIP CARDS – Up to 100 subjects. Cards with mini cards inside. ALLEN & GINTER DOUBLE RIP CARDS – Up to 45 pairings. NEW! 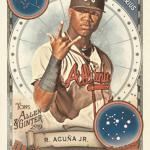 BASEBALL STAR SIGNS – Pairing star players with their astrological signs. NEW! MARES AND STALLIONS – Featuring select horse breeds. NEW! INCREDIBLE EQUIPMENT – Featuring legendary weapons and tools from fictional characters. NEW! THE HISTORY OF FLIGHT – From Kitty Hawk to the Moon and beyond. NEW! LOOK OUT BELOW – Celebrating the most picturesque waterfalls from around the world. NEW! CHUGGING ALONG – Featuring all different types of engines. NEW! LOST LANGUAGES – Highlighting languages and dialects no longer spoken. NEW! IN BLOOM – Rare and beautiful flora are featured. NEW! DREAMS OF BLUE RIBBONS – The world’s most curious contests are showcased. 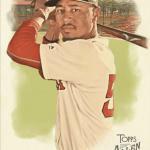 ALLEN AND GINTER BOXLOADERS – The game’s most collectible rookies and stars. 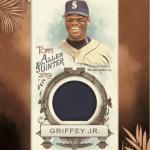 ALLEN AND GINTER N43 BOXLOADER – Greats of the game on a classic card format. Limited!